The Future's Rosie: Ever felt like pulling your hair out? ..."Might be a bit of a struggle in your case Tom!" I hear you say. However for Rosie things are a bit different. To be honest with you this post doubles up as a cry for help/advice/reassurance as much as anything else. We have started to notice recently that Rosie's hair has started to thin at the front and a few scabs have appeared in the same area. It hasn't been until the last couple of days we've really noticed she has definitely lost hair and is developing a bald patch. It was difficult to tell for sure how this was occurring until yesterday when our suspicions became evident – Rosie is pulling her own hair out. Karen came into the room and saw Rosie pulling at her hair and noticed a big clump of hair lay out in front of her. As you do (not always the best advice) but instinct often takes you to Google to see what the cause may be. I'd love to say she's trying to look like me but joking aside it's clearly more concerning. We had two thoughts initially, one that she may have an irritation on her scalp (hence the little scabs) and she's trying to attack it, itch it but grabbing at her hair too OR she has some deeper underlying issue. Google took me to something called 'Trichotillomania'. From www.trich.org: "Trichotillomania (also referred to as TTM or "trich") is currently defined as an impulse control disorder but there are still questions about how it should be classified. It may seem to resemble a habit, an addiction, a tic disorder or obsessive-compulsive disorder. Most recently, it is being conceptualized as part of a family of "body-focused repetitive behaviors" (BFRBs) along with skin picking and nail biting." This morning Karen took Rosie to the doctors and both our suspicions were discussed as a possibility. Obviously our hope is that she has nothing more than a rash and the antifungal shampoo she has been prescribed will clear it up, relieving any irritation, however we have to think of the possibility of it being a behavioural disorder of sorts and how we might help distract her, prevent, or teach her to stop before it has a permanent lasting effect on her hair. 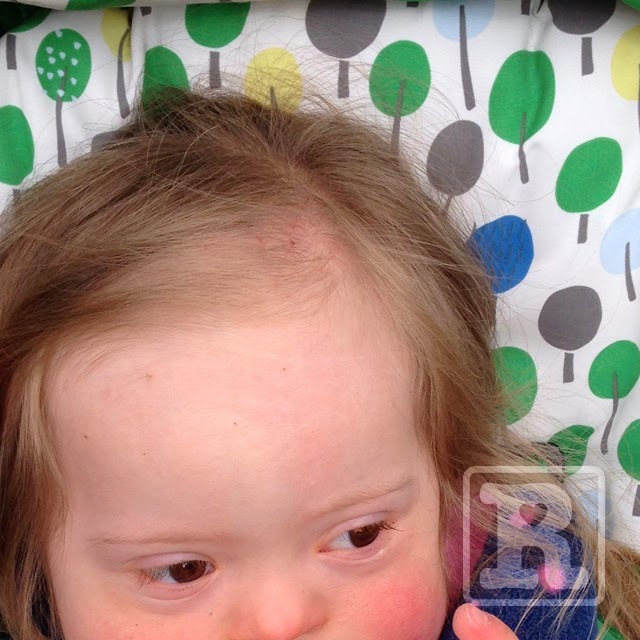 Obviously the fact Rosie is very young and has Down's syndrome makes reasoning with her almost impossible at this stage. If you have any experiences of something similar, any advice or better still reassurance it would be very much appreciated! Poor Rosie and you! My daughter ( not DS) did this, it worsened when she was nearly 3 and had a new brother. She wrapped her hair round her fingers and then pulled it out.It looked a mess so I had it cut short, this broke the habit as she couldn't get hold of it to pull it out! My little lad Nathaniel gets those scabs it drives him mad, his doctors give him steroid cream now as they become infected quite easily, do not know how you will detract Rosie as my liitle boy used to scarch n itch even in his sleep, sorry not more help. Oh dear...sweet girl this is not a fun thing to do! I am sorry to hear about this terribly distressing thing! I have neither heard of, nor seen this condition at all. I sure hope the shampoo and medication helps! You guys are always in our prayers too! Much love from Utah! She is absolutely beautiful still! Sorry to hear about this. Sam occasionally bangs his head against things and it happens when he is bored or frustrated. It hasn't happened a lot, but I know from my teaching experience with special needs children that it is a tendency along with other repetitive and sometimes self-harming movements, like biting ones own hand. Each time I have said a clear "no" and then quickly distracted him with something interesting. I think distraction is good. Keeping a close eye on it to prevent it becoming habitual is good too. I am sure your loving attention will see to the end of this phase. I would be a little cautious with the shampoo as people with DS have extremely sensitive skin.